The TV documentary that originally sparked the Defence of East Sussex Project was shown again yesterday. The programme was the second in a 3-part series entitled The Real Dad's Army shown on Channel 4; I recently found my 2006 video copy and was going to watch it and write this piece in a few weeks' time to celebrate the Project's third anniversary, but this unexpected repeat has brought this forward. 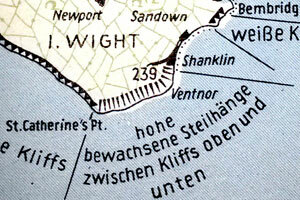 ...spare time and weather permitting, I may get out and about during the summer to visit the invasion coast. The rest, as they say, is history. 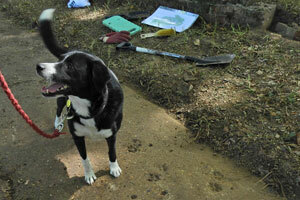 However, part of my initial enthusiasm was that having just begun to compile a blog, I was finding it a lot harder to find subjects to write about than I had anticipated and so my early trips into the countryside were as much about generating material for my blog as they were studying anti-invasion defences! Three years down the line, I've consulted nearly 300 files in 26 visits to the National Archives, extracted the details of nearly 1,500 defence and related works from these documents into a database (with an estimated 2,000 still to add to it), created http://www.pillbox.org.uk, and expect to write a book in the future - not a bad 'accident' for somebody desperate for material! The question now is, what are my impressions of the documentary in the light of what I know now? The quick answer is: mixed. My first query is why a series focussing on the Home Guard devoted an entire episode to anti-invasion defences. Before my inbox fills with complaints, I should explain this remark. 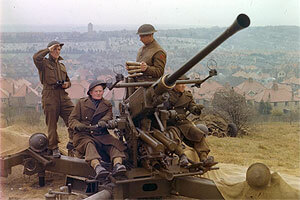 It was not just the Home Guard manning the defences; the Field Army's role needed to be discussed too. Yes, the Home Guard did man some beach defences in 1940 (Bexhill Home Guard members did so with just 35 rounds per man) and later manned coastal batteries, but only a solitary remark by the presenter hinted that the coastal crust was held by professional soldiers. 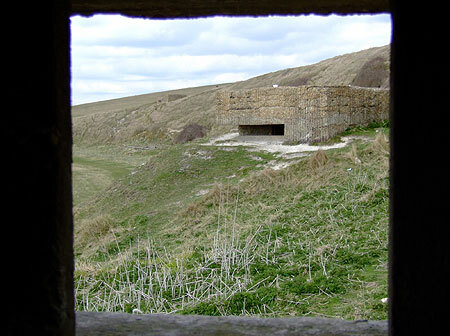 Though it was not specifically stated, I do remember at the time getting the impression that the Cuckmere Haven pillboxes (right) were manned by the local Home Guard; my documentary research has since shown otherwise. Which brings me onto my usual condemnation regarding the lack of documentary sources; although the programme was nowhere near as woeful in this respect as the Time Team at Shooter's Hill fiasco, I think more could have been gained by perhaps finding a suitable map trace of a nodal point (or other Home Guard locality) from the archives and explaining it. I'm sure enough research had been/was being done during the Defence of Britain Project and the Defence Areas Project to have identified suitable documents that leant themselves to this. The example of a bridge surrounded by defended buildings with loopholed walls was an excellent location; even a simple computer graphic showing the layout of the buildings and their fields of fire would have been so much better than the disorientating close-ups of various loopholes. A final quibble is that the impression was given that the coastal crust defences were constructed first, followed by the stop lines and then by nodal points (although the latter term was not used). This seems to have occurred by confusing defence in depth with chronology; all three systems were being constructed in 1940 and not one system after the other. Indeed, construction of the defences continued into 1942; the Z1 anti-tank scaffolding defence at Cuckmere Haven was not completed until January of that year. The run-through of the 1974 invasion wargame part actually mentions German forces landing at Cuckmere Haven in September 1940 and coming up against scaffolding; as far as I know, work on erecting the scaffolding was not begun until 1941. 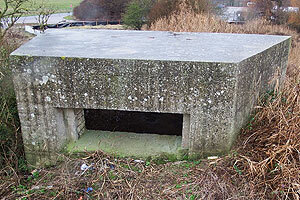 My impression of the documentary now is that somebody wanted to do a 'pillbox' episode but was constantly having to reintroduce a Home Guard aspect into the programme to get back on topic, or else looked at the Home Guard manning of defences and got sucked into the pillbox angle too deeply. A positive section was the aerial filming of the Carmarthen Stop Line in Wales; seeing the occasional pillbox jutting forward of a line of dragon's teeth (cubes) was fantastic. A slight query was the sequence filmed in front of some WW2 barbed wire. I have a sneaking feeling that the corkscrew pickets might have been artificially planted to enhance the picture; one of them was wobbling more than the scenery in Neighbours upon the slightest touch. Part of the Carmarthen sequence also included input from expert Roger Thomas and never was a statement truer than his observation that "When people see a pillbox they're blinded by the concrete - they forget the earthworks." This was a trap I quickly fell into, although I don't regret buying the http://www.pillbox.org.uk/ domain in my rush to "get pillboxing" online. As for earthworks, I've located 136 trenches and breastworks during my Downsforce project as well as a handful of trenches at Bexhill, Catsfield and Cuckmere Haven - how did I get to find all of these? 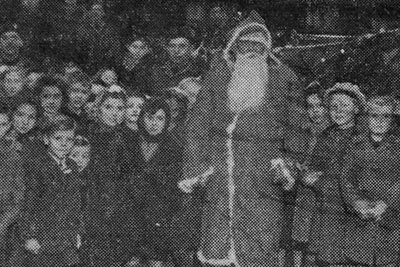 Documentary evidence. Which, as regular readers (both of you), will know is my oft-repeated (and oft-ignored) battle cry. Think of the impact this documentary, despite its faults, has had; it sparked me to embark upon the most comprehensive post-war survey of anti-invasion defences in East Sussex ever attempted. Now think what wider interest might be generated by even a short TV series (6 hour-long episodes?) on Sealion and the anti-invasion defences of the UK. The various aspects of The Real Dad's Army series could be incorporated within context and the real story of the invasion scare be told through the use of documentary evidence (there's that phrase again) combined with oral evidence and field exploration of the sort already discussed. If this sort of project were conducted along the lines of the BBC's highly popular Coast series (or based on the ITV regions) each episode could discuss a particular aspect of the invasion with region-specific follow-ups led by local experts/research, then who knows what might be achieved? An existing (e.g. garden) wall into which a loophole has been made by the removal of bricks or stones. Usually applied to freestanding walls as opposed to walls in buildings, which are known as defended buildings.